The name Dr. A P J Kalam conjures up an image of a scholarly person. And of a person of vision and dedication. However, it was also fascinating to observe his rock-star status among the youth, recently, at a function. It was my good fortune to help play a role in organizing, do some brand promotion and participate at an event in a medical college. Dr. A P J Kalam was the chief guest at this function. Dr. Kalam’s down-to-earth attitude, humility, ability to strike a chord with the audience, scholarship, genuine concern, tone of a dedicated person … was all awe-inspiring. Dr. Kalam’s presence created an inspiring thrill amidst the gathering. Dr. Kalam, the scientist, administrator, policy maker, winner of all the top three civilian awards of India (ie., Padmabhushan, Padmavibhushan, and Bharat Ratna), past-President of India - comes across as a highly integrated personality. There is integration between his thoughts, words and deeds. And this last rare quality creates an aura that is ethereal. SO WHAT DOES BRAND KALAM STAND FOR? Brand builders and marketers have a lot to learn from Kalam - the brand persona. Standing aside and observing the crowd of listeners and Dr. Kalam - it was a lesson in marketing! This very scientific opening to his talk was a superior attention getter. People listened to him with rapt attention! Kalam successfully commanded the attention of his target audience! Brand Kalam is serious and dedicated to his target audience: Dr. A P J Kalam announced that he would read a speech prepared for the audience at SDMC. His Excellency then proceeded to read the title of his prepared speech (it was on medical practice and compassion). The fact that Dr. Kalam had prepared an exclusive speech for this event, this itself made the audience bond with the speaker. When a person says there is an exclusive speech for the audience, there is a lot of significance. It means that Dr. Kalam has given a lot of importance to the audience. 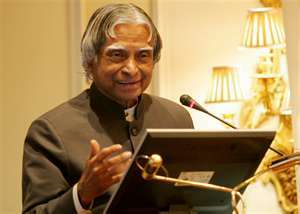 It implies Dr. Kalam has dedicated his thoughts, energy and time for the audience in preparing for the event’s speech. That affirmation itself created enthue among the listeners. Brand Kalam simplifies complexities: Brand Kalam has a keen sense of humour and ability to simplify complex issues. The lucid presentation gelled well with the target audience. Simplicity is the height of sophistication. Making things simple requires a person to go deep into the problem and understand. Dr. Kalam has excelled in the art of simplification. Simple things have only one destiny: they succeed enormously. Think of all successful brands and products: iPad, electrolyte energy drinks in Tetra Pak package (in Indian pharma market), Wikipedia, google, coke … they make a simple promise, they offer convenience, they are simple, understood easily by target audience members, and they become a part of the lifestyle easily. Brand Kalam is knowledgeable: The philosopher – saint of India, Swami Vivekananda, has said: Man’s search is not just for comforts, it is in fact for knowledge. When brands have a knowledge base and communicate insights, knowledge, wisdom, and information they gain the confidence of prospects and customers. Take any brand, they may be simple but they enjoy reliability or trust because the brand is backed by knowledge. Coke is a big brand: it has become big through the knowledge of customers and brand promotion based on this knowledge. Kalamji is a person of knowledge. He believes in knowledge absorption and dissemination. Kalamji speaks with tact and in a people or customer friendly way. The knowledge is not intimidating. It is packaged in a user-friendly manner. Knowledge is consumed easily when Dr. A P J Kalam speaks. Google is a big brand, this is because, google offers knowledge to seekers in a friendly approachable way. Knowledge makes a brand big, presenting knowledge with user-friendliness makes the brand bigger, this is why Brand Kalam is larger than life! Brand Kalam is stern: Brand Kalam is not about being funny and humourous – it is seriousness with a sliver of humour. This makes Brand Kalam appealing. Brand Kalam is not boring, thanks to the anecdotes, humour, ready repartees and one-liners. During the speech, Dr. A P J Kalam administered an oath for the medical students regarding ethics, and to focus on rural practice also. This was amazing. Brand Kalam was being stern when required; Brand Kalam made people adhere to a certain value system. Brand Kalam is about certain values, principles, ethics and a code of conduct. This makes Brand Kalam enduring. The Bhagawad Gita is an enduring book of wisdom: the timeless values encased in this book makes the ‘song of the divine or Bhagawad Gita’ enduring. Values espoused and practiced by Kalamji make him an enduring brand. Values make a brand enduring. Brand Kalam is purposeful: Brand Kalam is a brand with a mission, which is based on a vision. Kalamji is an empowering brand, so that as per Brand Kalamji’s vision, finally, India will emerge a developed country by 2020. This sense of purpose makes brand Kalam big. Brand Kalam inspires guides, provides a sense of direction to those who connect with the brand, empowers, satisfies, delights and gives hope for the future. So the lesson for us brand marketers by observing Brand Kalam is here in a nutshell: Make the brand say an authentic story, make the story alluring, use excellent attention getters, be serious about your dedication to the target audience, simplify complexities, be elegant, ensure that the brand is a mine of knowledge and wisdom (for eg., Van Heusen shirts not only talk about the brand benefits, but the advertisements also present technicalities showing that the brand is knowledge based, this helps generate customer confidence), be stern when it comes to standing for certain core brand values and ensure that the brand has an integrated personality (the brand promise and brand performance should match). The development of totally drug resistant TB in certain cases here in India is a serious happening. The Govt. of India needs to relaunch a health awareness campaign on TB and its treatment with zeal. There is an excellent article in Economic Times, 8.1.2012, page no. 18, on the importance of Vit. B12 (cyanocobalamine). The article has highlighted that Vit. B12deficiency, more common in vegetarians, leads to many debilitating diseases. It’s worth reading, I expect pharma companies to see a market gap here! Vit. B12 prices – will shoot up due to increased demand in coming months?! Thanks for reading this blogpost, please scroll down, click on older posts, wherever required, to read other posts, kindly recommend this blog to your acquaintances. WISH YOU ALL A HAPPY NEW YEAR 2012! !